Students can test every 8 weeks if they are ready. Once a Purple Belt, the students must do a midterm to get the decided rank before testing for their next belt. All Students must earn their required stripes before being allowed to test. 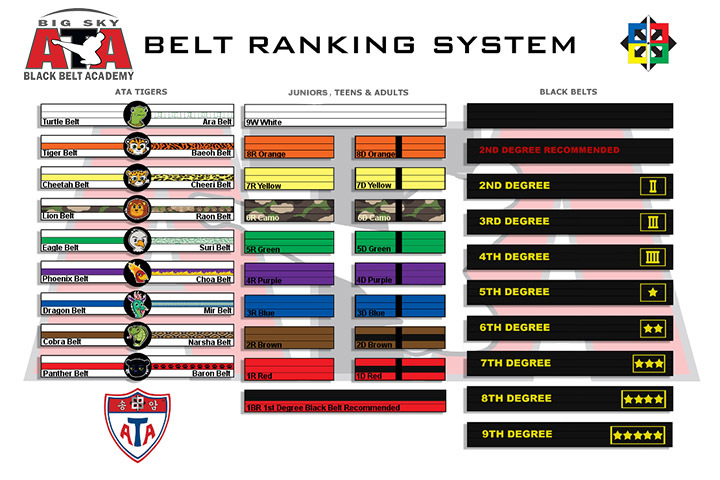 • The First Stripe is for knowing their basics for each belt, as well as the self- defense techniques that they learn. • The Second Stripe is for knowing their form and being able to perform it well. • The Third Stripe is for Community Service. • As well as the parent stripe awarded if the students demonstrate the life skill of the cycle at home upon reaching Camo Belt, an additional Fourth Stripe is earned for demonstrating appropriate sparring techniques. Upon reaching Purple Belt the requirements for the fourth stripe also include demonstrating appropriate board breaks. The good news is that at Big Sky ATA Black Belt Academy in Missoula, our Juniors program is the perfect companion to help you raise a strong, confident leader, teaching confidence, focus & self-defense skills. While the student develops their body during taekwondo training, they are also training their mind with the practice and teaching of the life skills; Discipline, Honesty, Respect, Communication, Self-Esteem, and Belief. Each testing cycle there will be a different life skill that will be the focus. The final component of the Juniors Program is the community service aspect, which helps to develop the student’s spirit. A student must perform some act of community service in order to test for their next belt. The reason is to get the students to donate their time and energy to make the community of Missoula a better place.